Last Thanksgiving we spent a week in the Poconos with Dan’s cousins Nate and Jess. While initially it was weird to not attend a big family dinner, it ended up being one of our favorite Thanksgivings yet. We ate, drank, hiked, relaxed, and cooked a really fantastic dinner. It also pushed me out of my comfort zone (brining and frying a turkey) and forced me to experiment with a method I’d been wanting to try- grilled turkey. Nate and Jess had a nice large bird waiting for us when we arrived and I decided to fall back on a few favorite ingredients- butter, garlic, and rosemary. I inserted two heads of garlic directly into the turkey, rubbed it down with a generous amount of salted butter, and topped it off with fresh rosemary. After a few hours on the grill it was perfectly cooked, and completely delicious. Grilling the turkey over indirect heat allows the skin to crisp up and for the bird to cook through without drying out. It also freed the oven up for all the delicious pies and casseroles we had going in and out, which helped keep the meal fun and casual instead of stressful. Which is my ideal kind of Thanksgiving. Rinse your turkey and remove gizzards and neck. Peel garlic and set one head aside. Cut a series of slits in the bird’s breast, thighs, and wings; stuffing the garlic cloves into the slits as you work. Rub butter generously over the bird, getting under the skin when possible. 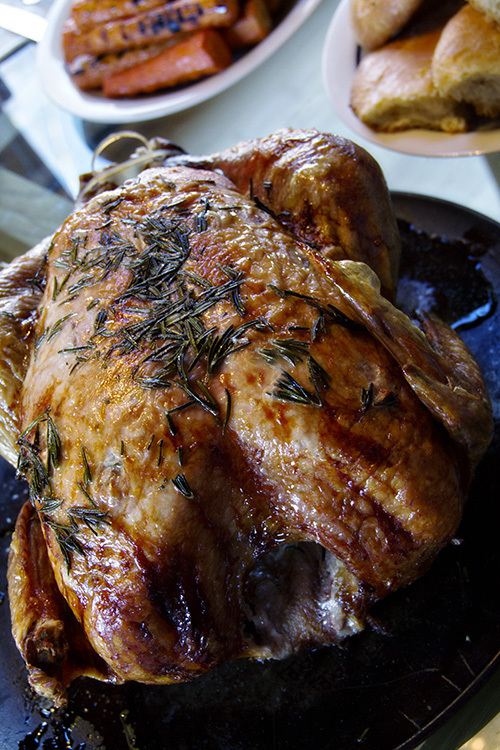 Divide the rosemary in half, rubbing half into the skin of the bird and placing the other half in the cavity. Add remaining garlic to the cavity along with the rosemary. Sprinkle bird with salt and pepper and tie the back legs together. 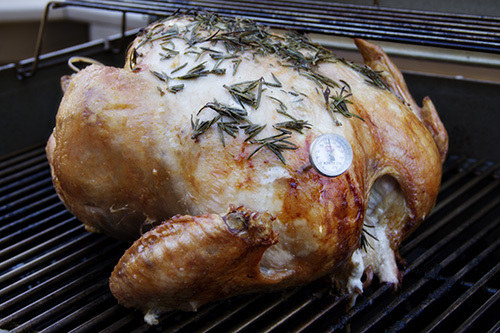 Grill for 12 minutes per pound or for 2 1/2 hours (with a 12lb bird) or until breast meat temperature has reached 175F. Let rest 1 hour before slicing. That’s a beautiful bird. 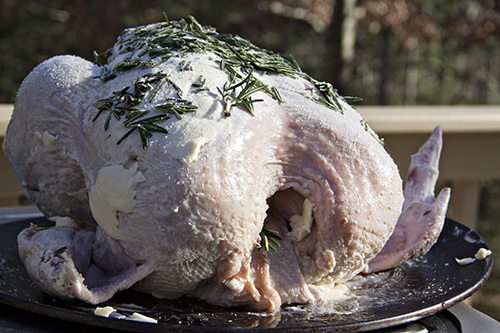 What better combination of ingredients are there for a turkey but butter, garlic, salt, and rosemary! I’ve never cooked turkey on a grill. Sounds like a great idea! Thanks for a great post! Gorgeous turkey! This screams Thanksgiving.